A long time ago, my father was in jail for a small misdemeanor crime (he only served a month) and my mom was out of the country. At the time, my parents were divorced, so my dads girlfriend was the one who was supposed to babysit me for the month. My mother didn’t like that. She called the police and they came to take custody of me since I wasn’t with a legal guardian. The cops then took me to an orphanage. Being the age of 7, this was the scariest thing ever. There were kids there that were bigger and the adults weren’t nice. I knew no one either. I was put in a room with four other kids and given a bottom bunk. After being put to bed, I cried and cried until the kid above me called my name. 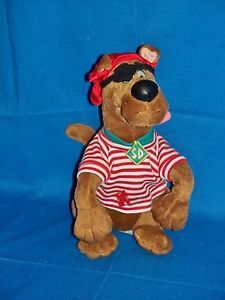 He then tossed me down a stuffed Scooby Doo animal with an eye patch and bandana. He said I could have it to make me feel better. It did. I took the thing in my arms and went to bed. When I woke up the next morning he was gone. I’m grown up now. I still have the Scooby Doo on my dresser. Another example of when one divorced parent aims and fires at their ex..They miss but always a direct hit on the children! My first thought was how selfish your mother. 😦 But how wonderful that little boy was to you. Oh my kats!🙀 In sorry you got sent to the orphanage!! But I’m so glad somebody there comforted you!